“Get a job at the American Embassy,” was the answer everyone gave whenever I was unemployed or mentioned wanting to change jobs. Local friends, along with family and friends back home, thought that working at the American Embassy in Athens was an easy solution to finding a familiar work environment surrounded by fellow expats, a good salary and a little prestige thrown in. It’s a great — if obvious and old — idea, but reality is not that simple. In fact, most people who make this suggestion do not understand what it requires. In addition to the visa and work permit issues that American/non-EU citizens face as described in “How Americans/non-EU citizens can move, live and work in Greece,” which I suggest all non-EU citizens read, getting a job at an embassy of any nationality (American, Canadian, Australian, British or otherwise) is no easy task no matter who you are and where you come from. This article was written with the intention of passing on the wisdom I gained through first-hand experience and advice given by embassy personnel to help you understand the reality of working for an embassy. Deciding to apply/work there is a unique personal choice found within yourself, depending on your goals, principles, qualifications and connections. I am not a job placement agency, I do not represent the embassy or consulate, and this website is not a forum for gathering a census. Names were changed to protect the privacy of those referenced. — Acquiring security clearance involves taking a Foreign Service Officer Test (FSOT), achieving a certain score, passing an oral examination, going through an intensive background check and interview process in Washington DC, serving your first diplomatic post in a “less desirable country” for four years and transferring every four years to a new post with no guarantee of being awarded any of the countries you’ve chosen. See “Careers representing America” for more information. — In the 14 years I’ve lived in Athens, I’ve seen a progressive drop in vacancies and know people who have been laid off. I cannot speak intelligently about whether this is a worldwide trend or for a specific local reason in Greece. It is most likely due to economic reasons (i.e., budget cuts) or shifting priorities to another region. — Temporary or short-term positions have been few, with just as much competition. They don’t necessarily lead to more permanent full-time positions, although it is good experience and good for a CV. — The Embassy does not have job listings for employers in Greece and does not offer assistance in placing Americans since Greece is an EU country and America and other non-EU countries are not. You compete with everyone. There is no distinction between nationalities (aka, there is no such thing as “Jobs for Americans in Greece”) and the fact you are a non-EU citizen with permit issues makes it more challenging unless you can stake a claim to EU citizenship through an ancestor. — It is not the Embassy’s job to dispense accurate or current information on visas for Greece, residence or work permits for Greece or other local bureaucracy. Their mission is to provide services having to do with the homeland, meaning U.S. passports, U.S. visas, U.S. citizenship, Social Security benefits, U.S. notary services. All consulates and embassies are diplomatic missions and guests in the host country, not authorities, and cannot override local laws. Serving your country abroad entails a different lifestyle and set of compromises, according to friends and relatives. Many families choose to live apart, and those that don’t sometimes suffer the strain of changing countries and culture every four years. Of course there are diverse groups of people who work for the Embassy, but absolutely everyone I know comes from a diplomatic family. — Ektor’s father has worked as an Ambassador his whole life, and Ektor is a local bodyguard here in Greece. Please note that he is highly educated, holds special security clearance, speaks three languages and is an ex-championship boxer; he’s not a musclehead. — Deborah’s father was a diplomat before she herself became one; she’s now in Iraq. — Erica’s father is also a diplomat, and she served in Athens like he did before moving to Switzerland. — Georgia served in Athens before being transferred to Brazil, much like her mother before her. — Nathan has worked for the government since his early 20s, served two terms in Athens and is now retired. These families also have something else in common — divorce. All of my friends not only have parents who are divorced but are also divorced themselves. Of course, there are many successful diplomatic families whose marriage survived, but the few couples I know with two careers and children achieved this using their considerable wealth to hire a staff of housekeepers, nannies and drivers to assist them. (Note: I am not saying this is true for everyone, only the people I know). When I hear that Ektor picks out gifts and plans surprise parties for the Ambassador’s wife “from her husband,” it just confirms I made the right choice to stop the process of becoming a Foreign Service Officer. Perhaps if I’d started when I was younger with more tolerance for instability and discomfort, this would have been a solid career filled with exposure to different countries and cultures while serving my country. One reason I chose to leave my country was I disagreed with the elected president at that time and his government policies, so for me to even consider working for an embassy should speak volumes about my disdain for Greek bosses and my passion to build a bridge between Greece and the United States. First attempt: The first time I applied for a position at the embassy, I was rejected for not attending “one year of secretary school,” despite my B.A. and five years experience actually working as an executive assistant for a well-known multinational. With only two hours notice, I rush back home to put on my best suit and head to the Embassy, where the portraits of Bush, Cheney and Colin Powell smiled down on me in the bulletproof waiting room. A few minutes later, a man swung open the door and a young Greek girl with heavy makeup, overprocessed hair and kitten heels walked in. As she passed, the man cruised her up and down without discretion, and she turned and thanked him. “Are you Kat ____?” he asked. Oh, dear. The guy who cruised this girl’s backside was my interviewer and potential boss. A bit too friendly in our interview, I’d decided to sabotage my answers to avoid any chance of working for him and be thankful for my current job. He transferred out of Athens in 2002. I would only remember this day as the day I lost the sweater I wore to my mother’s funeral. Third attempt: In another interview for a different vacancy, I was one of 500 people competing for five, three-month positions during Athens 2004; nearly 90 percent were young Greek-Americans who knew each other and arrived in groups. We were called to take a competency test about consular affairs and the Greek language. I felt hopeful before the test because a woman from HR pulled me aside to talk, but after the test it became clear I may not make it to the next round, especially when a Greek woman sitting next to me remarked that she found it difficult. Final attempt: The last interview I was invited to attend was for a position that fit my qualifications perfectly. I could barely contain my enthusiasm. After waiting an hour passed the appointed time and finally sitting down to speak with a Greek-American woman who mirrored the Ann Taylor look I was wearing, she told me I was not only an impressive candidate, but an impressive person. She was ready to hire me but needed to finish the next three interviews. As I was leaving, she spoke to me in Greek, to which I answered at length, and then told me my fluency was the worst amongst everyone she interviewed. Sorry?!? When I politely stood my ground and confirmed that the ad requested “a native English speaker with rudimentary Greek,” she agreed I was more than proficient but clammed up and escorted me out. Friends believe she intentionally built me up so she could tear me down. Whatever her motives, I did not care to work for someone like that and considered it a blessing. An acquaintance named Nick claims his girlfriend was called and offered a job by the embassy after she sent them an unsolicited CV. The HR woman I spoke with at the embassy says this is highly unlikely because they only accept applications and CVs for posted open vacancies. To read about a local Greek woman’s experience with working for several embassies in Greece, I encourage you to read about Christine in “Comments.” It’s eye opening. The food in the commissary is deliciously authentic, there are countless resources, and the majority of people I’ve met have all been accommodating, efficient and extremely nice people both professionally and socially. But I decided it was no longer important for me to continue pursuing a job there. My favorable impression of the embassy has since been blemished by a Greek-American woman in the consular section who regularly plagiarized my website and Twitter feed in 2011-2012 — even after I warned her to stop — taking credit for informing citizens of strikes and starting an informational section covering the same topics I do (something never done in embassy history). I filed an informal and formal complaint, but no disciplinary action has been taken to date. Please be aware there are no American Embassies in Crete or anywhere else in Greece, just diplomatic missions in Athens and Thessaloniki. I don’t really know what to say, but I am grinning from ear to ear (not because you didn’t get a job!) because you are very funny and I totally understand. “As I was leaving, she spoke to me in Greek to which I answered at length and then told me my fluency was the worst amongst everyone she interviewed. Sorry?!? When I politely stood my ground and confirmed that only basic rudimentary Greek was requested in her ad, she agreed I was proficient but wrinkled up and politely threw me out. It’s a funny thing, actually. I had a split second to decide whether to ignore her comment and brown nose my way out of it or defend myself and point out her comment was unwarranted. Certainly I was disappointed because I knew I could do that job well, but it’s a blessing I found out she was like that before I worked for her. No one should be able to get away with that kind of behavior, and I’m certainly not intimidated by it. In the scope of my life and the world, she is a very small flea. More than that, it made me ashamed as an American that she would represent my country that way. Yea, well someone at the U.S. consulate in Thessaloniki needs to learn English. A few people, actually, including the consul. Although my second trip there was much better received, still, you should be able to talk to Americans in ENGLISH. But, working for the U.S. government? I think I’ll pass. I get sick enough looking at the photos when I go in just for business. You’re right! The Embassy in Athens has both excellent bilingual speakers behind the glass at “public” areas and native English speakers behind the wall that many never see. From what it sounds like, Thessaloniki could use a few more of the latter. Being it IS an American embassy, it’s normal to speak to an American in English since (other than visas), they are there to serve Americans. One of the reasons I left the USA was because I don’t agree with the government, so my attempts to work for them here should speak volumes about how desperate I was to get away from Greek bosses. It’s like voting for a President — it’s not that one is necessarily better than the other, just a choice between the lesser of evils. I arrived in Athens only 2 weeks ago, and after countless hours of looking at the Embassy website and other websites to figure out how to find a job here, I have to say- this is the most helpful website I’ve come across! It’s so true, EVERYONE has told me to go to the Embassy and get a job there; as if it could be that simple!!! I, of course, am not fortunate enough to speak even basic Greek, but I know it’s one of my goals while I’m here. Thanks so much for all your comments. They help immensely. I would have actually thought it was more difficult than you describe it to get a job in an embassy. Diplomatic jobs have always been among the best you can get. That’s right. It is horribly difficult! The point of my article was that one cannot just walk into the American Embassy in Athens and expect to get a job based on citizenship. Some people actually think this. It takes having a current permit, fluency in a language, security clearance that involves a test/interviews in DC/serving a post elsewhere first, education, experience and diplomatic ties, then beating out more than 1000 other people who are equally or more qualified. I don’t know for sure, but I’m guessing the Irish embassy can assist its citizens because they are in the EU, same as Greece. America is not and there are bureaucratic obstacles; I mean, what does it say when the embassy has to start a program to place their own diplomatic family members? It is difficult, I know. It just seemed a bit easier than what I’d expected. There’s a big demand for such jobs, and they’re usually very well paid, with lots of perks. Just getting an apartment near the embassy is tough! I’m guessing the Irish embassy can assist its citizens because they are in the EU, same as Greece. I hadn’t thought about that. You must be right on that. In addition to the US Embassy, there is an American Navy base in Crete and a small American military detachment in Larissa that sometimes has jobs for Americans but of course you have to move to Crete or Larisa. Worse places to live & work I suppose as Crete is a beautiful place. Larisa not so nice though. I’ve heard there is some status of forces agreement that says you cannot take an American Status job at any US Govt facility after you’ve been in Greece for over 3 months. The only jobs available then are as a local national status and then you are competing with Greeks and of course the small salaries that go with it. Good info on the subject and I hope you are successful finding a job at the Embassy. Just think, if you do maybe you can buy clam chowder soup. It’s one of the things I miss so much here in Greece. Hi Bob, thanks for your comments and information. I knew about the base on Crete, but my only contact there has left Greece so I had no ‘inside’ information and never asked. I’m actually not looking for a job with the Embassy, I wrote the article as an informative piece for those who for some reason think that getting a job there is a snap. Although I’m hardly an expert on embassy jobs, I’ve found over the years that those who did work for embassies (including the US one) were as unhappy as the general working population. There was once a time (30-40 years ago) when an embassy job meant good money and some privileges not offered to the “natives.” The American embassy, for example, paid in US dollars when the dollar was king… but then, around 1980, it smartened up and begun a payroll in drachmas (the euro story is a lot sadder — for the US government). As a UK embassy employee, you did have some special privileges, including permission to move to the UK after so many years of service (this is before EEC-EU). Some people did thrive under these conditions. US embassy Greek employees could even wiggle their way into the substantial PX, located on Syngrou avenue in a building now long gone, to do some shopping. Those were the days when a pack of Marlboros was a unique gift. More recently, I have heard only heartache stories from foreign embassy Greek employees, save some unique situations involving small missions representing exotic places. I think that you were lucky, in many ways, staying away from a mission job. The money is no good unless you occupy the highest grade and working conditions are average. im from greece and im working at the social security organisation here in greece(i.k.a)and i would like to know what kind of education i got to have to get a job at a greek empacy in the usa and if i have to work at the ministry o foreign affairs fist and then get tranfered at the states? Thank you for your question. However the mission of this site is to provide information for people interested in living and working in Greece, not Greeks interested in living/working in the USA. This is why the article above covers what is required for an American Embassy. If you want a job at the Greek Embassy, you should be asking your Greek government and not me, a non-Greek kseni immigrant with no access to this privileged information. Hi Kat, I was surfing the net this morning and came across this site and I’m very happy that I did. As for my experiences at embassies, they go sth like this. I left my job in the Greek private sector after 5 yrs in 2001 to take a job offered at the British Embassy. What a mistake! I ended up being senior accountant (having a university degree in political sciences, I was thrilled to be in an embassy) and to my dismay, my assistant was an ex-cleaner at a bank. Yes, her previous job was to mop floors!! Nonetheless, because she had been at the embassy for 3 yrs, I thought that she could be of some assistance, although she didn’t know great English and the English she did know was difficult to understand because she was an expat from Zimbabwe, which didn’t help much. Neither did the fact that she was 52 yrs old and hadn’t any computer skills, nor any other education beyond perhaps high school! To make a long story short, she would insist on her knowledge of things and then go in and complain about me to the officer in charge. Due to one of her massive mistakes, I got sacked after only 3 mths. and yes she still is there, while her son now works in the ambassador’s residence and helps in the kitchen! I was extremely upset, left out in the cold after losing that job, I honestly thought that I had failed. I had two children and tried to focus on them and my husband, but in the meantime I made efforts to get back into the embassy scene for personal and emotional reasons. I got a job at an African embassy close to my house, which I thought was great, and I was one of the secy. to the Ambassador. To my dismay this time, like the rest of the locally engaged staff members, I was only getting part-time social security stamps and 13 salaries rather than 14 by Hellenic legislation. As for the working hrs, they didn’t have standard ones, and they are awful when it comes to time management. As for the put-downs by African diplomats towards everyone, not only myself, I can’t begin to describe the events. After 1 1/2 yrs, I said that my family obligations would not allow me to work these endless hrs, esp. when there wasn’t any work to be done. It was all, again, about bad time management. I again had this insecurity that I carried with me, which had formed with the British Embassy, that I had to prove to myself I can get a job at an embassy because I’m worth it! (2) these forms to IKA were being filled out behind the embassy’s back and that, although the forms were taken to IKA, no payments had ever been made by the embassy to IKA regarding our stamps because the specific embassy does not insure its staff!!! (4) personal cell phones were to be used for embassy purposes to facilitate diplomats at our own expense!! Kat, for almost a yr, I had a cell phone of 300E /mth, and a salary of 900 E, which were only paid 12 times!!! I thought, oh my word, this is worse than the African embassy. To top it off, my co-worker aged 48 would come to work, in a Muslim environment, with leopard leggings, a short belly top a black thick belt and cowboy boots, which the Arabs loved!! I, on the other hand, would go in my brown/black/grey Anglo-Saxon pants suits, very conservative esp. when they would compare! When something would crop up with the Ambassador, there was my co-worker from consular section and her Syngrou Ave. outfit ensembled with her push up bra to assist the Amb. I could not top that, and honestly I didn’t want to. Summer vacation was around the corner, and I was very much looking forward to getting away to Paris and then Mykonos with the family. Ten days before my leave, the Amb. calls me on my cell phone to tell me that I made a mistake with an invite concerning the MFA. To sum up, the MFA called the Amb. on his cell phone and told them that it was their mistake, but he said that his decision had already been made to sack me! I got angry Kat, and I said this is just about enough with all these ludicrous missions in Athens. I went to the MFA and they said they would assist me with my issue and see it through to the labour inspection authorities regarding payments, social security, bonuses and unfair dismissal. So a court case via the district attorney’s office will take place sometime in 2008, knowing how tardy the Greek judicial system is. But no matter how many lessons I’ve learned, I still carry this awful feeling of being unsuccessful in me. I applied again to an embassy and after having read your experiences and now putting mine down for the first time, I’m now thinking that I’ve most likely overestimated the entire job market in foreign missions. Hi C and thank you for taking the time to share your experiences. Ted, the commentator above from June 30, had stated there were many people like you, and therefore you are not alone and should indeed NOT feel insecure or unsuccessful for not flourishing in a foreign mission environment. It’s like he said, working at an embassy as a local (Greek, repatriated Greek, EU citizen or non-EU with authorization to work in the EU) is many times no different than the regular private sector. I’m under the impression people who benefit and enjoy it most are Foreign Service Officers and diplomats who are imported from their home country and placed in positions every 4 years. Further, I know very few people who are happy with any job located in GR — private, public or consular. The content people I know are usually: a) those who have their own business (but may have different headaches dealing with taxes, inter-industry politics, etc. ), b) those who are connected and paid good money to essentially not work, c) those who don’t have aspirations to a burgeoning career or upward mobility, or d) just really lucky people who found something they like without pressure to pay rent because they received property as a gift. The other content people I know either don’t work (lucky them) or have jobs with companies located outside GR and are paid decently. Thank you again for opening up and taking the time to share your many experiences as a local in Greece working for embassies. I feel it gives people valuable insight and breaks down stereotypes in people’s minds, which is what this site is about. A very informative website. This post and the comments sections has really been an eye-opener. If I can add my own 2 cents. My parents are Greeks who moved to N. America many years back. Like most Greeks in the diaspora, they dreamed of moving back with their families but the subject of jobs for their kids always crept up. From the experience of my friends and I it seems as if all Greeks of a certain generation think that working in a foreign embassy is *the* holy grail of jobs in Greece. I don’t know how or why but I always thought this was a huge mirage and gross misunderstanding of the job quality and prospects of Embassy work in Greece. Thanks to this post it has been confirmed. Thanks so much for adding your two cents. Yes, even now people tell me, “Why don’t you get a job at the American Embassy in Greece?” You know, like it’s so easy. And people really think that. Naive. Beyond the Embassy, it’s not easy to get a job in Greece that honors merit and hard work, pays well and has room for promotion. Your suspicions were confirmed by the article, and my article was confirmed by those who generously shared their stories about working for embassies and consulates in Greece. I surfed the internet for something entirely different and found your page – pretty cool and very true. I currently live in Austria and used to live in the US for quite some time. Since I went to the German School and had friends, whose parents or one parent worked at either the german or swiss embassy (small community), I got to see a lot of the inner workings and it seemed to be the same crap as 10 years ago. Thanks so much for stopping in and confirming that embassies in other countries can be just as dysfunctional. Kat, I must say that your information here is real! 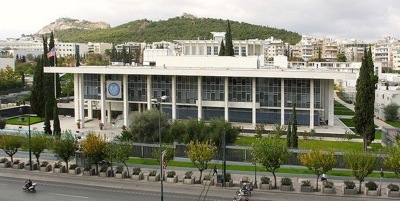 Are you sure you have not been hired to discourage folks from applying for a job at the US embassy in Greece? Seriously, your account is consistent with several other accounts of people that I have known, including folks that actually worked there. There appears to be a lack of professionalism, extensive internal intrigue, and “groupies” at just about every position level. I believe that this is due to the fact that they operate so far from the US, that anything goes. Rather than representing the very best that US Management Practice, Human Resources Management, and Labor Practices have to offer, the US Embassy over the years has not served as a beacon of light in this arena. After all, this is Greece, and anything goes…especially at the US Embassy and other US affiliated/sponsored institutions! This paradigm is a true failure of our foreign policy in Greece. Hi Dino, that’s right. It’s real; maybe a little too real for some people’s comfort. But I think it’s important to be honest, so no one is surprised by the obstacles they may face or somehow rejoice in embracing other options. I heard a story the other day about an ex-employee, quite a miserable woman by everyone’s standards, who ended up winning a lawsuit with damages awarded. Sometimes it’s good to get away from the familiarity of one’s country and break through barriers; unfortunately, some people don’t know where boundaries should be drawn. If you don’t know someone from the inside, you won’t get a job, because it’s their people who they want to help first. See the section, ‘Work for the American Embassy’; I’m not a job agency. Unemployment in Greece is 27.9%. You would have a better chance of going to the UK. l want to apply for a job and give my best which l know l can, but who will higher hire a dj and a singer? Some may laugh but believe me working at night is the biggest school ever(even though l went to A.C.S of Athens ).